Video: During the first lesson, it may be helpful to show the class a video of the sport (see “More Ultimate Frisbee” for additional video resources). The Basics of Ultimate Frisbee: A team sport played with a flying disc and governed by sportsmanship (Spirit of the Game). Key points: Ideas to convey to beginners. Ultimate is team sport a little bit similar to football or soccer, but without contact and referee, where the ball is a frisbee. You play with a specific, high-quality plastic frisbee disc (heavier than most toy ones). You can’t run when you have the frisbee, only pivot and pass it to another teammate. Your teammates can run anywhere trying to get open for your pass. Your team tries to complete passes until you catch one in the other teams’ end zone, which counts as one goal. But the opponent will try to block or intercept your passes! You’ll need speedy, skilled and smart players to score. It’s not a contact sport – you cannot hit or knock down other players, and you can’t grab the disc from someones hands, or a ‘foul’ will be enforced. There are some basic skills needed which we will learn first, for safety and to help you get acquainted with the disc, and then soon we can start playing a full game. Safety Considerations: Common hazards that can be avoided or mitigated. Be aware about obstacles and danger objects around the field. Make sure you don’t throw to someone who isn’t looking at you. Practice catching first and foremost so players aren’t surprised and hit by the frisbee disc (especially in the face). Become familiar with how the frisbee flies through the air to prevent collision by players who are running for a disc. When playing on a hard gym floor or on pavement: no diving. If you play in a grass field, wear cleats to prevent players falling on the ground during cuts (change of directions). Playing on grass with sneakers can be slippery. Return all discs to the equipment bag between games and activities so they aren’t lost, damaged or stolen. Field: Consider the field site you’ll be using for the rest of the lessons. 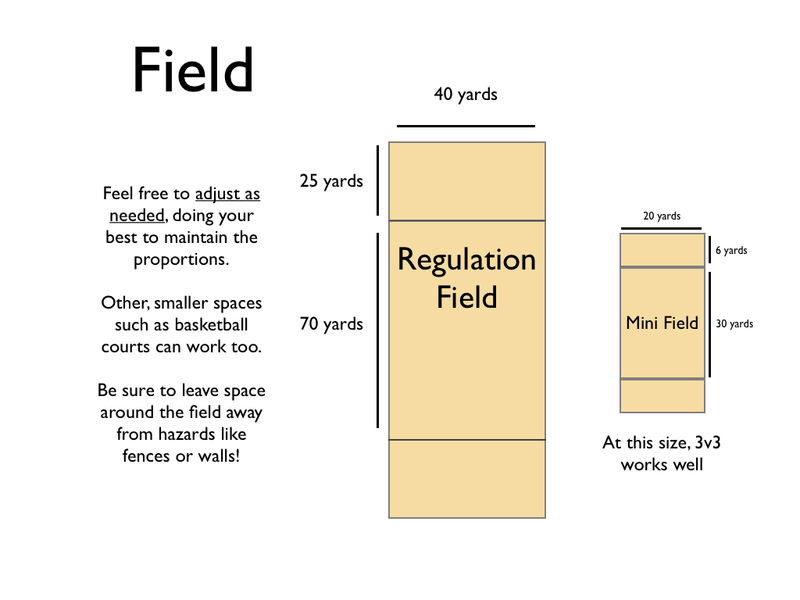 Below are the full field dimensions, but often PE Teachers will have to make adjustments appropriate to their soccer field, football field, basketball courts, etc. Ultimate can be played on a variety of surfaces – soft grass is preferable – but gym floors, other flat surfaces and even parking lots may apply. Whatever surface you chose, know the risks and be aware of what is around you and your students.